Observe, observe and then observe some more. I study the movement of sunshine, water retention, wind and water flow on every garden before, during and after installation. It's become a bit of a game to see how much effect slightly raising a section of a garden has on adjoining areas, how the implementation of shade effects moisture, temperature and so much more. My goal was to explore extending seasonal production and plant variety in an "urban" appropriate space. I wanted to disprove the Monsanto Spin about needing two acres per adult in order to produce enough sustenance for them to survive. There was an impressive mound of soil, really lousy clay soil, that was piled up as the result of a pond we had just dug. It was the perfect platform to really get creative and sculpt a multi-tiered garden, which we refer to as the "Waterfall." Its purpose was to let us study how many extremely different climates we could create in a relatively small setting. 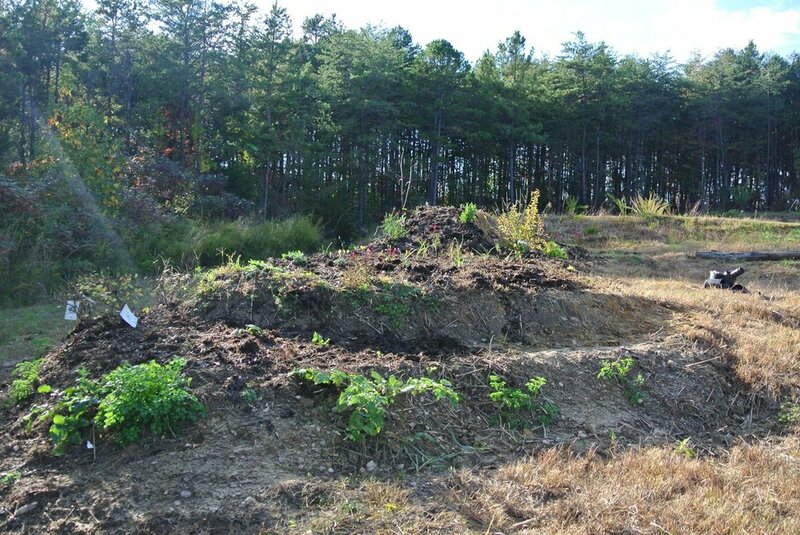 The first year, we spent spare time just spreading out this mound, throwing compost and extra seeds of turnips, beets, beans and brassicas in an attempt to add some organic matter. The following year we began to form it a bit, but concentrated on adding layers of more compost and seeds. Josh gives great perspective - he's about 6' tall, standing on the second terrace, which is clearly more than 6' above ground level. This picture was taken, looking at the north eastern side of the garden. 4 levels are visible from front to back. This picture was take mid/late afternoon and even on a bed this small, it clearly shows sun/shade produced simply by the terrain that we created. This can easily be magnified with plantings. Josh is working on the northern part of this garden. The southern, shady terraces are on the left. The top three pictures are from the third year, 2014. Josh spent a fair amount of time sculpting the bed. We then introduced perennial hardy herbs: parsley, oregano, lemon balm, lavendar etc., as well as a cherry tree, and surrounded the western edge with an asparagus bed to gift a little shade from their fronds in late summer. Year four, the soil was beginning to look pretty good and we planted seasonal crops on the top two terraces and slope (after sheet mulching), added Honeyberries on the southern terrace, and blueberries on the eastern edge surrounding another fruit tree. We planted the ground-level area surrounding the southern edge with Seaberry. None of these berries will thrive here in full sun, not to mention our late summer drought. We then planted fall crops of leafy greens on the cooler southern terrace, almost two months earlier than usual. They thrived! This is the north eastern corner, which when compared to the picture from a few years ago, makes me pretty happy. This picture is current, taken from the south east corner. The soil is beautiful by comparison from where we began. We are growing several varieties of both honey and sea berries, so the tags will remain for a couple more years so that we can see which varieties are happiest. Please pay no attention to the silver martians in the back ground. I'm determined to grow olive trees here and I wrapped then for the winter. The current southern view - which is wonderful vs it's first year of existance. This is year five, 2016. Sean and Ian stacked large stones on the southern side to hold any easing of the terraces, which could damage our seaberries, and to define another layer/ground level for additional planting. These stones will not provide a heat sink since they are in the shade; there are no worries about altering this cool zone that we've created. We are going to intensely plant the Waterfall this year. I will continue to add photos as well as document the harvests. The garden is 17' wide and 54' long. It basically runs east to west. The southern side of the bed is shaded by an evergreen tree line except during morning hours, and has a minimal afternoon wash of sun. The soil temperature is notably cooler and the soil stays relatively moist, even during our drought season. During the heat of the summer, there is greater than a 15-degree soil temperature variance within this bed. That is HUGE! The northern side of the bed actually gets some late afternoon sun except where an upper terrace shades the slope below. The flat part of lower terraces get pelted with late high-UV sun. The western areas of the bed are extremely hot and dry and do not get any benefit from the early morning dew burn-off from sunrise (we are high humidity).